Founded in 2006 and listed on Euronext in 2013, Orège is a clean-tech company that has developed an innovative, patented technology (SLG) to significantly reduce sludge treatment costs and improve environmental sustainability of the treatment process. Its core markets include North America, UK, Germany and France. Orège has developed a proprietary technology that reduces sludge treatment costs for clients by up to 80% and implies average payback periods of less than three years. FY18 appears to be an inflection point for Orège, with a large pick-up in order intake. Although the early stage of commercial development implies risks, we believe there is large valuation upside if Orège can establish its technology as industry standard. Note: *Net income is normalised, excluding amortisation of acquired intangibles, exceptional items and share-based payments. Orège operates in the global wastewater equipment market ($9.5bn per year market size with 5–6% annual growth). Orège has developed a proprietary and patented technology (Solid Liquid Gas, SLG) that reduces sludge treatment costs for utilities by up to 80%, with a strong investment case for its clients (payback periods of less than three years). In addition to large economic savings, SLG drives important environmental sustainability advantages to the sludge treatment process (lower energy use and volumes transported, improved sludge quality, etc). Over the last few years Orège has developed several successful references for various applications and geographies and is now ready to achieve its full commercial potential, particularly in the UK and North America. Client feedback on the technology strongly supports the effectiveness of the SLG technology. 2018 appears to be an inflection point for Orège, with a strong pick up in order in-take, which we expect to lead to a large year-on-year increase in revenues, albeit from a low base. We forecast FY18 revenues increasing 2.7x to €2.6m and rising to our estimated base case of €57m in FY23, based on our forecast of an addressable market size of €439m a year (North America, UK, Germany and France). We calculate that EBITDA and cash flow break-even require €18m and €21m revenues respectively. As Orège’s net equity fell below half of its called-up share capital in 2017, there is a regulatory requirement for Orège to proceed with a capital increase by the end of FY19. Due to the early stage of commercial deployment, investors should assess a large range of potential growth outcomes and valuations. Our base case valuation of €3.86/share reflects a sustained growth in revenues mostly in the UK and North America. If Orège can establish its technology as industry standard and its products become widely adopted, we believe there is very large upside to the current share price (our valuation would be €9.36/share). On the contrary, the bear case of €1.64 reflects the impact of potential delays in ramping up the commercial development of the company. Orège’s proprietary SLG technology reduces sludge treatment costs for utilities by up to 80%, with a strong investment case for its clients (payback periods of less than three years). In addition to large economic savings, SLG brings significant environmental sustainability advantages to the sludge treatment process (lower energy use and volumes transported, improved sludge quality, etc). Over the last few years Orège has developed several references for various applications and geographies and is now ready to achieve its full commercial potential. We see the greatest potential in both industrial and municipal clients in North America (by far the largest market for Orège, in our view) and in the UK water industry (smaller than North America opportunity but with a much more concentrated potential client base). As Orège is at an early stage of commercial deployment, a large range of potential growth outcomes and valuations should be considered. Our base case valuation of €3.86/share reflects a sustained pick up in revenues as a result of growing adoption of its technology. If Orège can establish its technology as industry standard and its products become widely adopted (as clients fully trust the economic and environmental benefits of the technology), we believe there is significant upside to the current share price (our valuation would be €9.36/share). On the contrary, the bear case of €1.64 reflects the impact of potential delays in ramping up the commercial potential of the company. Development of new products and entry in new geographies would represent upside to our forecasts and valuation. We expect new order announcements, growth shows at FY18 results and a potential FY19 guidance announcement to be the key catalysts for the share price over the next 12 months. FY18 appears to be an inflection point for Orège, with a strong pick-up in order intake (also driven by recent prominent client win and feedback, such as from Anglian Water) that we expect to lead to a large year-on-year increase in revenues, albeit from a low basis. We forecast FY18 revenues increasing 2.7x to €2.6m and rising to our estimated base case revenue potential of €57m in FY23. Our estimates are based on a forecast of a €439m annual addressable market size for SLG technology (current applications only) in North America, UK, Germany and France. We expect high operational leverage to drive a strong margin improvement, leading to a positive EBITDA in FY21 and cash flow in FY22. As Orège’s net equity fell below half of its called-up share capital in 2017, there is a requirement for Orège to proceed with a capital increase by the end of FY19. We have considered bull-bear scenarios in addition to the base case included in our forecasts. We have applied various penetration rates to our estimate of the SLG addressable market. Our analysis suggests a revenue range of €22–93m (vs base case of €57m) for medium-term revenues (we have assumed five years from now, in 2023). 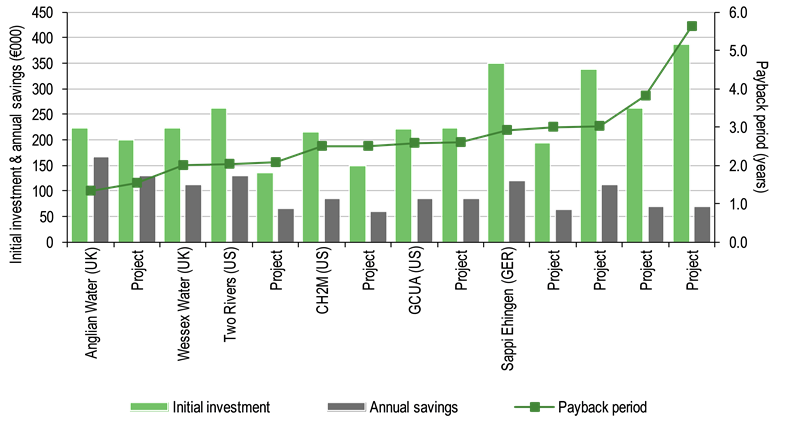 We have estimated that Orège requires c €18m revenues to reach break-even EBITDA. Similarly, to reach cash flow break-even (excluding costs related to the financial structure, ie financial expenses), we estimate Orège needs to generate revenues of €21m. Key risks to our forecasts and valuations include: delays in ramping up commercial development, including risks associated with the requirement to organise public tenders for municipal clients; higher/lower competition and its impact on profit margins; and potential impact from Brexit and trade wars (most of the addressable market is in the UK and North America). Orège provides advanced solutions for improved sludge thickening and dewatering processes to industrial and municipal customers. Following the wastewater treatment (including sedimentation, aerobic biological process, filtration, disinfection etc), the remaining sludge material is normally treated further. Thickening is the first step of the sludge treatment process and aims at further separating liquids from solids. Dewatering reduces the amount of water remaining in the solid portion. The thickening and dewatering processes are essential to improve the efficiency of the operations, to reduce the volume of the transported sludge, the size of the facilities and ultimately to reduce operating costs for the utilities. Following treatment, sludge is transported for disposal. Orège’s key technology is SLG, a compact add-on solution that can be added to clients’ existing water treatment equipment to improve the performance of their thickening and dewatering equipment. The installation of SLG technology requires only limited and inexpensive modifications to the existing client equipment, so the switching cost is generally limited to the purchase and installation of the SLG equipment. Combined with other equipment, Orège has also commercialised a standalone solution for thickening. The SLG technology changes the sludge physical, chemical and rheological characteristics. The ‘SLG effect’ generates an emulsion that enables improved thickening/dewatering of raw sludge. This improvement is achieved in several stages including the collision and mixing of the gas (ambient air) and the solid/liquid (sludge) using a specific injection system, and sequences of compression/depression. The process results in two different effects: 1) macro, which consists in a significant increase in the porosity of the sludge and a replacement of part of the water with injected air; and 2) micro, which includes the destructuring of bacterial colonies and the reduction of their aggregate size, resulting in increased porosity. Eight key patents protect the technology (and the associated equipment) in around 50 countries, for 20 years starting from 2010–15. Orège also patented SOPHYS, a more complex and much more expensive technology (€1.5m vs €0.1m–0.4m for SLG) aimed at effluent treatment; however, Orège has decided to focus on SLG, which has been assessed as having stronger commercial potential and a clearer investment case for clients. SOPHYS is a technology that brings more environmental than economic benefits to clients; hence it is mostly driven by tightening regulations (push) rather than economic benefits for clients, whereas SLG offers substantial savings for clients (pull), hence it is easier to persuade potential clients of the benefits of the technology. Three aimed at thickening activities: SLG stationary unit; SLG mobile unit + fixed FLOSEP (a thickening unit with proprietary technology); fully mobile SLG + FLOSEP. Three aimed at dewatering activities: SLG stationary unit either positioned before screw press, before belt filter press, or before centrifuge. The SLG unit is very compact: it can be easily transported by a 2m x 4m trailer attached to a light vehicle and is set up in under 10 minutes. The equipment operates at an ambient temperature and consumes little electricity (< 0,5kW/m3/h). The compact size and transportability make this equipment particularly suited for small sludge treatment plants, which are widespread in the UK, US and France. As an indication, depending on application (dewatering vs thickening) and the associated equipment and geography in which it is deployed, Orège’s SLG solution costs €100,000–400,000 per unit. Excluding product manufacturing, Orège directly carries out all the other activities itself, including R&D, industrial design/engineering, certain product assembly, marketing or commercial activity, installation and other services at its clients’ premises. Orège was founded in 2005 by Pascal Gendrot (CEO), Patrice Capeau (scientific director) and Michel Lopez (who retired in 2015). The company was listed on Euronext in July 2013 (IPO price €3.24). 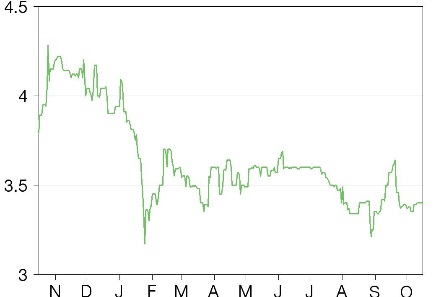 In 2014, Eren increased its stake to 69% with a public offer (at €4.20/share). Eren is a conglomerate focused on ‘natural resources efficiency’ with >€600m of shareholder equity and significant investments in renewable energy, water equipment, energy solutions and infrastructure monitoring. Over the years Eren has provided all the required financing to Orège (which at the end of H118 had c €37m outstanding debt to Eren). In the case of a capital increase at Orège, we would expect Eren to convert a large part of its debt into new equity. Orège has around 60 employees (including consultants). In addition to the French headquarters and research centre, Orège has subsidiaries in the US and the UK. Over the last several years, Orège has achieved several references for its SLG technology and run successful tests in France, Germany, UK and North America. Orège has received international awards, including 2016 Distinction in the category ‘Breakthrough Technology of the Year’ at the Global Water Intelligence Awards and Most Innovative Technology at Birmingham Utility Week in 2017. As we developed our long-term sludge dewatering strategy, the SLG solution was clearly the most environmentally friendly and financially attractive option for the Town of Hammonton. The main challenge successfully addressed by Orège and its SLG solution has made it possible to drastically reduce transportation costs while maintaining effluent compliance. We have chosen to implement the SLG solution for its outstanding performance capabilities, enabling us to reduce our sludge transport costs. These costs represent a major expense for us and we had been looking for a suitable solution to reduce them for a long time. The SLG solution is perfectly aligned with our environmentally responsible approach, giving us more effective control over the risks associated with the conditioning of our sludge. The results are impressive. The SLG project has exceeded all of the established performance criteria. The cost savings for the Newmarket Water Recycling Centre and surrounding sites are around £150,000 per year, and another five areas have already been identified with similar levels of savings. Carbon emissions from transporting the sludge in tankers are forecasted to be down by 50 per cent as a result of the project. We believe SLG’s ability to save costs for utilities / industrial operators is the key selling point for the technology. We have analysed Orège’s key historical projects. Based on client’s investments in the projects and savings from the implementation of these solutions, we have calculated an average payback period of 2.7 years (with a range of 1.3 to 5.6 years), which we see as very attractive for both municipal and industrial clients. Source: Company data, Edison Investment Research. Note: ‘Project’ refers to undisclosed projects. Orège’s strategy is focused on achieving several references for various applications in the core target geographies of the group: North America, UK, Germany, France. With the development of several references, Orège aims at establishing its solutions as technical standard in the sludge thickening and dewatering market, to achieve full commercial potential. In addition to these core strategic objectives, Orège aims at developing further business potential, both in new geographies (in particular in Asia-Pacific, where the company is not present) and in new technological applications (enhanced anaerobic digestion, pelleting). Orège’s management includes most of the key people that in the 12-year history of Orège were responsible for developing the technology, for listing the company in 2013 and for attracting the investment of one of the most significant investor in the clean-tech space (Eren, 69% stake). Key executives include: Pascal Gendrot, CEO and co-founder, with more than 20 years experience helping small to medium sized corporates to fundraise and grow internationally; Patrice Capeau, scientific director and co-founder, who is responsible for all Orège technology and patent development since inception; George Gonsalves, CFO, who has a background in accounting and corporate finance consultancy in France and the UK and a previous experience as CFO of the French subsidiary of the Game Group (consoles and video games). These three executives own c 11% of the capital of Orège. The treatment of wastewater/sludge is universally recognised as one of the greatest environmental challenges globally. While in low-income countries the biggest issue is the lack of infrastructure, in high-income countries tightening environmental regulations and potential economic benefits suggest the need of an upgrade of the existing treatment plants. Low-income countries: while in high-income countries around 70% of wastewater is treated, this ratio drops to 28% in lower to middle income countries and to 8% in low-income countries. Overall 80% of wastewater globally is returned to the ecosystem without treatment or re-use (Unesco, 2017). As a result 1.8 billion people drink water contaminated with faeces, which exposes them to infectious diseases (Unicef, 2015). Although there has been some progress with global access to sanitation facilities (increasing to 68% in 2015 from 54% in 1990), the improvement fell short of the UN Millennium Development Goal (77% sanitation access), with the largest areas for improvement in African countries and large parts of South America and Asia. High-income countries: most mature economies have facilities in place for wastewater/sludge treatment, but there is large room for the improvement of their economic and environmental performance. Focusing on the economic benefits of an improved sludge treatment process, the cost of sludge disposal is generally high. As a result, large savings are possible in the case of efficiency gains in the treatment process. At the forefront of sludge treatment options are new technologies aiming at extracting energy from sludge, through anaerobic digestion and composting, transforming sludge to a valuable resource. In addition to economic benefits, significant environmental benefits can be achieved with upgraded treatment infrastructure, such as higher quality of the disposed material, lower energy use, etc In some cases, upgrades are driven by tightening regulations (eg German market, page 11). Orège’s SLG product offers a technological innovation to a market that is characterised by well-established and consolidated technologies, which, for most part, have been employed for several years. The size of the market where Orège operates is significant: according to a study by Frost&Sullivan (2016 Global Water Market Outlook), of the $54bn global water and wastewater treatment equipment market (2016 revenues), approximately $9.5bn relates to the business areas where Orège operates, ie equipment for wastewater pre-treatment ($2.1bn), sludge thickening ($2.2bn), dewatering ($2.8bn), sludge digestion ($1.1bn) and drying ($1.2bn). These figures exclude the revenues from services associated with the equipment sale (such as installation, maintenance, etc), which we estimate are equivalent to 50–100% of the equipment business. According to Global Water and Intelligence, the growth rate of the global wastewater market is 5–6% a year. Orège focuses on four geographies where it sees significant growth potential: France, Germany, North America and the UK. In Germany, c €550mn is spent annually in new wastewater equipment according to the Federal Statistical Office and the DWA. In the US Global Water Intelligence estimated $1.1bn was spent in new wastewater equipment in 2017, of which c $330m for municipal dewatering/thickening specifically. In the UK, Global Water Intelligence estimated there was $365m investment in sludge management equipment in 2016. The sludge dewatering and thickening processes are generally undertaken with a plate/frame filter press, centrifuge or a belt filter press. Most of these technologies have been employed for a long time (20 years+) and little innovation has taken place. Orège’s SLG is an add-on performance enhancer to any of these technologies. The largest companies operating in this industry are Alfa Laval (pumps, centrifuges, filters, etc), Andritz (Separation division, which manufactures centrifuges and other pumps), Suez (Water Technologies & Solutions division, which recently acquired GE Water), Veolia (Veolia Water technologies division), HUBER Technology (product offering including screw presses, belt filter presses, dryers) and Hiller (which manufactures mobile dewatering plants). One of the most innovative companies in the industry, Cambi is a leader in advanced anaerobic digestion and biogas solutions for sewage sludge and organic wastewater management and in thermal hydrolysis. While most companies offer traditional sludge dewatering and thickening equipment, Orège offers an innovative add-on solution (as well as a standalone thickening solution), ie a patented performance-improving technology that aims at reducing utility costs, improving environmental sustainability and increasing the efficiency of the process. Crucially, the SLG is a mechanical wastewater/sludge treatment technology and not a chemical process, which uses expensive chemicals and has much greater environmental impact. We derived our forecasts for Orège’s top line by applying a range of penetration rate assumptions to the estimated size of the core market opportunities for the flagship product SLG in the key countries for Orège: UK, North America, Germany and France. We provide detailed calculations below. We highlight that our forecasts are exclusively based on these four geographies and do not include several large business opportunities for Orège, see Future development for more details. Source: Edison Investment Research. Note: *French potential estimate based on other markets’ size. Orège entered the US market relatively recently, in 2015. Business development for Orège has been faster than in Europe, with the company involved in nine projects in North America to date (completed or in progress), selling 12 SLG units. The key opportunity for Orège is the dewatering market, where it can target a large number of clients: according to company estimates around 9,000 belt filter presses and between 1,000 a 2,000 screw filter presses operate in this region. Additional concrete business potential includes the sale of add-on solutions for the thickening market, where an estimated additional 3,000 plants operate (gravity belt and rotary drum thickeners). We estimate the addressable market for Orège’s SLG technology in North America is €260m a year, which is significantly larger than the combined potential in the UK, Germany and France. The estimate includes a large contribution from services revenues, which we believe is an attractive market with visible long-term prospects for Orège. This estimate does not include the business potential related to dewatering solutions for centrifuges (c 5,000 centrifuges operate in North America, according to Orège) and to static thickeners and gravity tables. Source: Edison Investment Research. Note: *asset life could be extended to 15–20 years with additional maintenance capex. The UK sludge treatment market is characterised by a large number of small plants (about 9,000 sewage treatment works). Orège’s SLG mobile unit is particularly suited to addressing this market as it can operate over several treatment plants and achieve large efficiencies and returns for the utility. In the UK, Orège has sold four SLG units (one to Wessex Water and three units to Anglian Water). In particular Orège has received a strong endorsement by Anglian Water (see quote in Exhibit 1), which has subsequently stimulated interest for SLG technology from the entire UK water industry. The key advantage of the UK market is the high client concentration (12 wastewater companies in total), which should speed up the commercial development. We estimate the addressable market is €37m a year. This estimate refers mostly to mobile solutions and does not include other business opportunities such as fixed thickening solutions for gravity tables and dewatering solutions (for belt filter presses or for screw presses). 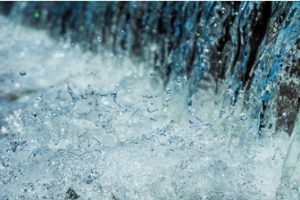 As a cross-check to our forecasts and to assess the materiality of the savings brought by SLG for potential UK clients, we have carried out an analysis of the impact of SLG adoption on the UK water sector. Assuming a payback period for SLG investments of between one and five years (the average payback for Orège references is 2.7 years), we estimate that Orège’s SLG technology could lift profit before tax of the UK regulated water sector between 3% and 16%, which we view as very significant. This economic benefit would be on top of large environmental benefits. The German market is characterised by more stringent regulation, which sets a favourable environment for the development of Orège. New regulations (Sewage Sludge Regulation, which introduces the obligation of phosphorus recovery for larger sewage treatment and Fertilizer Ordinance, which introduces stricter pollution limits) restrict sludge land-spreading and favour higher incineration use, which is very expensive. Hence we believe solutions, such as Orège’s SLG, which reduce sludge volumes and improve dryness have strong development potential and can achieve very large savings for municipalities. The largest market targeted by Orège in Germany is the sale of SLG add-on solutions to centrifuges (the most widespread dewatering technology in Germany, with 47% market share). We understand Orège is concluding its first reference in German centrifuges and is able to offer a fully commercial solution. The number of large German dewatering plants (>100,000 people equivalent) where Orège’s technology have highest technical and commercial rationale, can be estimated at 400–500 units, based on company information. On this basis and including the revenue potential related to services activities, we estimate an annual addressable market for Orège (municipal centrifuges only) of €12m. Additional applications include add-on solutions for the industrial sector (for example, food and beverages and industrial chemicals), for anaerobic digestion plants (1,200 dewatering plants, or 13% of the German total, are already equipped with anaerobic digestors) and screw press plants, where, however, Orège has yet to develop references. The water industry is generally conservative, risk averse and dominated by well-established technologies. Innovation is slow and new technologies generally need a large number of tests and references before being widely adopted. In this context the lack of growth of Orège’s revenues over the last few years may be frustrating for investors but not surprising to industry operators. We note, however, that FY18 appears to be an inflection point for the company with a large pick up in order intake, which we estimate should allow for 2.7x year-on-year revenue growth (albeit from a low basis). The pick up is driven mostly by the US (with orders from both municipal and industrial clients), and the UK, where the Anglian Water support at the end of FY17 appears driving large interest from other utilities (see Exhibit 1). H118 results showed a strong pick up in revenues, +100% year-on-year to €559k (albeit from a low basis). Higher revenues combined with a 17% reduction in operational costs led to a smaller EBIT loss (€4,567k vs €5,780k) and a smaller net loss (€5,593k vs €6,764k). New products: the ability of Orège’s SLG technology of improving the separation of water from solids has the potential to drastically improve advanced sludge treatment solutions, such as anaerobic digestion and pelleting. We would expect the company to develop new solutions for these markets over the next few years. New geographies: although our forecasts assume relatively high penetration in four markets, we have not included any contribution from several geographical areas with high potential. In Europe, countries such as Switzerland, Italy and Spain could be large markets for Orège, although the company has no examples of completed projects in those countries currently. Asian countries have huge development potential for Orège, but the region has not been a priority until recently. On 16 October 2018, however, Orège announced that it has signed a partnership for distribution and integration of its SLG solutions in Japan with ITCMT, a subsidiary of the Japanese ITOCHU Corporation. Orège's partnership with ITCMT covers the marketing and distribution, integration and maintenance of its SLG solutions throughout Japan, for both industrial businesses and municipalities. This partnership may accelerate product deployment in the region. Pascal Gendrot, CEO and co-founder is a post-graduate of the Management School of Lyon and has an accounting background. He has more than 20 years’ experience helping small to medium-sized corporates fundraise and grow internationally. In 2002 he founded and ran his own consulting firm providing advice to small to medium-sized businesses and in 2006 co-founded Orège. He started his career at Peat Marwick (now part of KPMG) and later joined BDO Group, where he became a partner, founding manager of the corporate finance and strategy department, and member of the management committee and managing partner of BDO France. Patrice Capeau, scientific director, is an engineer who started his career in applied engineering in the water sector and had technical responsibility for businesses involved in the supply of drinking water and in the treatment of organic waste and sludge (Sogreah, Alcatel Alsthom Group, then Alpha Logic). He created Hodis in 2005, which became Orège in 2006. George Gonsalves, CFO, is a Chartered Accountant who started his career at BDO Binder Hamlyn in London and then joined the corporate finance team in Paris advising on acquisition due diligence, fundraising and auditing. In 2002 he joined the French subsidiary of the Game Group (consoles and video games), where he served as CFO until 2009. Kevin Dunlap, Orege North America CEO has 22 years’ experience in sales and management roles in the water and wastewater treatment industry (including at American Water, US Filter, ITT Industries, Waterlink and BCR Environmental). Ian Patehyjohns, Orege UK CEO has 26 years’ experience in various roles in the water and wastewater treatment industry, including innovation management, strategy and business leadership (at Siemens, United Utilities, Atkins). The management team owns a significant stake in the company. As of 28 February 2018, Pascal Gendrot owned 6.40% of the capital, Patrice Capeau 4.11% and George Gonsalves 0.70%. We believe the potential for adoption of Orège’s SLG technology is large, but a number of potential outcomes should be assessed. We have therefore considered bull and bear scenarios in addition to the base case included in our forecasts. Starting from our estimate of the addressable market, we have applied various penetration rates, based on several factors including discussions with the commercial teams of Orège and our assessment of the product adoption speed and business development potential of the company. Our analysis suggests a revenue range of €22–93m (base case €57m) for medium-term revenues (we have assumed five years from now, 2023). As set out in Exhibit 14, we have estimated that Orège requires c €18m revenues (approximately 72 SLG units assuming an average price of €250k for one SLG) to reach break-even at EBITDA, which, in our base case we expect in 2021. Similarly, to reach cash flow break-even (excluding costs related to the financial structure, ie financial expenses) we estimate Orège needs revenues of €21m (84 SLG units). These calculations are based on the cost structure, gross margin, capex and working capital we estimate for our 2019e base case. As Orège is at an early stage of commercial deployment, a range of potential growth outcomes and valuations are possible and there are significant downside/upside risks to our forecasts and valuation. As the company is loss making, we believe its value depends on its ability to grow and generate cash flow in the future. Our base case valuation of €3.86/share reflects a sustained pick up in revenues. If Orège can establish its technology as industry standard and its products become widely adopted, we believe there is significant upside to the current share price (our valuation would be €9.36/share). On the contrary, the bear case of €1.64 shows the potential impact on valuation in case of delays in ramping up the commercial potential of the company. We expect new order announcements, growth shown in FY18 and a potential FY19 guidance announcement to be the key catalysts for the share price over the next 12 months. To reflect the early stage of Orège, we used a methodology similar to the one we use for early-stages biotech companies: we estimated the addressable market size, assumed penetration rates (see Exhibit 12 for more details on bull-bear penetration rates assumptions) and used a DCF methodology to take into account the future prospects of the group. We have used a 12.5% WACC, consistent with the rate we use for companies at a similar stage of development (sensitivity to higher and lower rates in Exhibit 19). To calculate the terminal value, we have normalised EBITDA and EBIT margins post-2035 (Orège patents expire between 2030 and 2035) to align them with the average margins of mature water equipment companies. We have then applied the peer group average FY18 EV/sales, EV/EBITDA and EV/EBIT multiples (Exhibit 17) to Orège’s corresponding financial metrics. Our terminal value for Orège is based on the average of the values implied by the respective peer group multiples (see Exhibit 18). Source: Edison Investment Research. Note: prices as at 27 September 2018. We highlight the valuation is very dependent on the WACC and the implied terminal value multiple (the implied base case terminal EV/sales multiple of 1.9x is based on the average of the valuations obtained by applying the average peer based EV/sales, EV/EBITDA and EV/EBIT multiples to Orège’s sales, EBITDA and EBIT as per Exhibit 18). These sensitivities are presented in Exhibit 19. Based on the bull/bear scenarios included in Exhibits 12 and 13, we have calculated the valuation sensitivities in Exhibit 20. The wide valuation range (€1.64 to €9.36) shows the impact of various growth scenarios and the speed at which Orège is able to develop its business. Ultimately we believe it is the reflection of the early stage of development of the company and of the risks associated with it. Revenues: we have assumed that Orège reaches our base case revenue potential (€57m) five years from now, in FY23. This is based on our central case penetration rates applied to the estimated addressable markets of North America, UK, Germany and France (€439m a year). Profit margins: our forecasts are based on the following considerations: 1) our estimate of current margins achieved by Orège; 2) the lack of competitors being able to offer a technology with the same potential should imply margins significantly higher than mature water companies (Exhibit 21); 3) the fact that economies of scale are likely to drive at least some margin expansion over the next few years; and 4) our valuation reflects a drop in margins to the industry’s average levels post-2035 when the key company patents expire. EBITDA: our forecasts suggest Orège will break even at EBITDA 3.5 years from now, in FY21. The EBITDA improvement is driven by the pick up in revenues, only partly offset by the growth in fixed costs (which we assume will grow 23% from €9.2m in FY18 to €11.3m in FY23). The high operational leverage to higher revenues means the EBITDA margin will increase to 25% and 35% in FY22 and FY23, on our forecasts. Net income: Orège can benefit from a large accumulated tax loss position (€70m at the end of H118). As a result we do not expect the company to pay taxes for the next 10 fiscal years at least. We forecast a FY23 net income of €14.2m. Orège has been generating negative cash flow, accumulating a net debt of c €39m at the end of H118 (of which c €37m to shareholder Eren, with a maturity of two to three years at a cost of 7%). We expect Orège to generate additional negative cash flow until the end of FY22 (€34m in FY18-FY22, including financial expenses), after which we expect sizeable positive cash flow generation. Our forecasts include a significant positive contribution (€0.8m a year) from French state grants (linked to R&D and development investments). Under French company law, if net equity falls below half of its called-up share capital, shareholders can vote to continue the corporate activity but there is a requirement to proceed with a recapitalisation by the end of the second fiscal year following the vote. Orège’s shareholders voted for this in the eighth resolution of the annual shareholders meeting of 24 May 2017 and so the company has until the end of FY19 to recapitalise. As per Edison policy, our forecasts assume the negative cash flow is financed by new debt. Delays in ramping up commercial development: municipal clients (which we estimate represent more than 50% of the addressable market size we estimate for Orège) are often required to organise public tenders when they place large orders. As a result sales to these clients are most at risk of experiencing delays, in our view. The development potential we see in the UK market is almost entirely from municipal clients, hence this risk is mostly concentrated in the UK, in our view. As a sensitivity, we estimate that every one-year delay in reaching our base case revenues pushes down our base case valuation by c 15%. Our bear case scenario reflects a significant delay in ramping up the commercial development of the company. Competition and profit margins: there appears to be limited competition Orège’s technology at the moment, which we believe should allow for higher than sector average profit margins for Orège. The emergence of significant competitors may put downward pressure on margins. Brexit and tariffs: most of Orège’s growth potential is in the UK (which is also one of the main sources of revenue at present) and in North America. Frictions to trade as a result of Brexit or changes to international trade agreements may impact our forecasts and valuation. Pascal Gendrot has a PhD and an accounting background and more than 20 years’ experience helping small to medium-sized corporates fundraise and grow internationally. In 2002 he founded his own consulting firm providing advice to small and medium-sized business and in 2006 co-founded Orège. He started his career at Peat Marwick (now part of KPMG) and later joined BDO Group, where he became a partner, founding manager of the corporate finance and strategy department, and member of the management committee and managing partner of BDO France. George Gonsalves is a Chartered Accountant who started his career at BDO Binder Hamlyn in London and then joined the corporate finance team in Paris advising on acquisition due diligence, fundraising, auditing. In 2002 he joined the French subsidiary of the Game Group (consoles & video games), where he served as CFO until 2009. Patrice Capeau is an engineer who started his career in applied engineering in the water sector and had technical responsibility for businesses involved in drinking water and in the treatment of organic waste and sludge (Sogreah, Alcatel Alsthom Group, then Alpha Logic). He created Hodis in 2005, which became Orège in 2006. Eren, Cambi, Andritz, Veolia, Suez, HUBER Technology, Hiller, Alfa Laval. DISCLAIMER Copyright 2018 Edison Investment Research Limited. All rights reserved. This report has been commissioned by Orège and prepared and issued by Edison for publication globally. All information used in the publication of this report has been compiled from publicly available sources that are believed to be reliable, however we do not guarantee the accuracy or completeness of this report. Opinions contained in this report represent those of the research department of Edison at the time of publication. The securities described in the Investment Research may not be eligible for sale in all jurisdictions or to certain categories of investors. This research is issued in Australia by Edison Investment Research Pty Ltd (Corporate Authorised Representative (1252501) of Myonlineadvisers Pty Ltd (AFSL: 427484)) and any access to it, is intended only for "wholesale clients" within the meaning of the Corporations Act 2001 of Australia. The Investment Research is distributed in the United States by Edison US to major US institutional investors only. Edison US is registered as an investment adviser with the Securities and Exchange Commission. Edison US relies upon the "publishers' exclusion" from the definition of investment adviser under Section 202(a)(11) of the Investment Advisers Act of 1940 and corresponding state securities laws. As such, Edison does not offer or provide personalised advice. We publish information about companies in which we believe our readers may be interested and this information reflects our sincere opinions. The information that we provide or that is derived from our website is not intended to be, and should not be construed in any manner whatsoever as, personalised advice. Also, our website and the information provided by us should not be construed by any subscriber or prospective subscriber as Edison’s solicitation to effect, or attempt to effect, any transaction in a security. The research in this document is intended for New Zealand resident professional financial advisers or brokers (for use in their roles as financial advisers or brokers) and habitual investors who are “wholesale clients” for the purpose of the Financial Advisers Act 2008 (FAA) (as described in sections 5(c) (1)(a), (b) and (c) of the FAA). This is not a solicitation or inducement to buy, sell, subscribe, or underwrite any securities mentioned or in the topic of this document. This document is provided for information purposes only and should not be construed as an offer or solicitation for investment in any securities mentioned or in the topic of this document. A marketing communication under FCA Rules, this document has not been prepared in accordance with the legal requirements designed to promote the independence of investment research and is not subject to any prohibition on dealing ahead of the dissemination of investment research. Edison has a restrictive policy relating to personal dealing. Edison Group does not conduct any investment business and, accordingly, does not itself hold any positions in the securities mentioned in this report. However, the respective directors, officers, employees and contractors of Edison may have a position in any or related securities mentioned in this report. Edison or its affiliates may perform services or solicit business from any of the companies mentioned in this report. The value of securities mentioned in this report can fall as well as rise and are subject to large and sudden swings. In addition it may be difficult or not possible to buy, sell or obtain accurate information about the value of securities mentioned in this report. Past performance is not necessarily a guide to future performance. Forward-looking information or statements in this report contain information that is based on assumptions, forecasts of future results, estimates of amounts not yet determinable, and therefore involve known and unknown risks, uncertainties and other factors which may cause the actual results, performance or achievements of their subject matter to be materially different from current expectations. For the purpose of the FAA, the content of this report is of a general nature, is intended as a source of general information only and is not intended to constitute a recommendation or opinion in relation to acquiring or disposing (including refraining from acquiring or disposing) of securities. The distribution of this document is not a “personalised service” and, to the extent that it contains any financial advice, is intended only as a “class service” provided by Edison within the meaning of the FAA (ie without taking into account the particular financial situation or goals of any person). As such, it should not be relied upon in making an investment decision. To the maximum extent permitted by law, Edison, its affiliates and contractors, and their respective directors, officers and employees will not be liable for any loss or damage arising as a result of reliance being placed on any of the information contained in this report and do not guarantee the returns on investments in the products discussed in this publication. FTSE International Limited (“FTSE”) © FTSE 2018. “FTSE®” is a trade mark of the London Stock Exchange Group companies and is used by FTSE International Limited under license. All rights in the FTSE indices and/or FTSE ratings vest in FTSE and/or its licensors. Neither FTSE nor its licensors accept any liability for any errors or omissions in the FTSE indices and/or FTSE ratings or underlying data. No further distribution of FTSE Data is permitted without FTSE’s express written consent.